Sadly, these days have never returned. By the mid 1950s speedway nationally was in a terrible downward spiral and, after Wembley folded, there were real fears that the sport would just fade away. Indeed, a Sunday Times colour magazine article in the mid 60s chronicling the sports amazing comeback was entitled “The Sport That Refused to Die”. 1958 would be the start of this rebirth with the proverbial green shoots of recovery popping up in fairly unlikely places – St Austell and Motherwell to name but two. Trevor Redmond was the inspiration for the former, while it was Ian Hoskins who led the way in Lanarkshire. Unlike previous attempts, the 1958 vintage was based on junior racing, although most of the Golden Eagles had previously ridden for at least one of the Scottish tracks. Motherwell tracked the Templeton brothers, Doug and Willie, Jimmy Tannock, Red Monteith, Gordon Mitchell and Fred Greenwell, all of whom had prior experience, with the final member of the squad, perhaps Ian Hoskins finest “find” George Hunter, a young grass tracker from Fife, who came to the fore in practice sessions held at Milton Street during the winter of 1957/58. Heady and highly optimistic stuff. The Eagles raced a number of challenge matches against juniors from Belle Vue, Bradford, Coventry, Leicester and Ipswich. 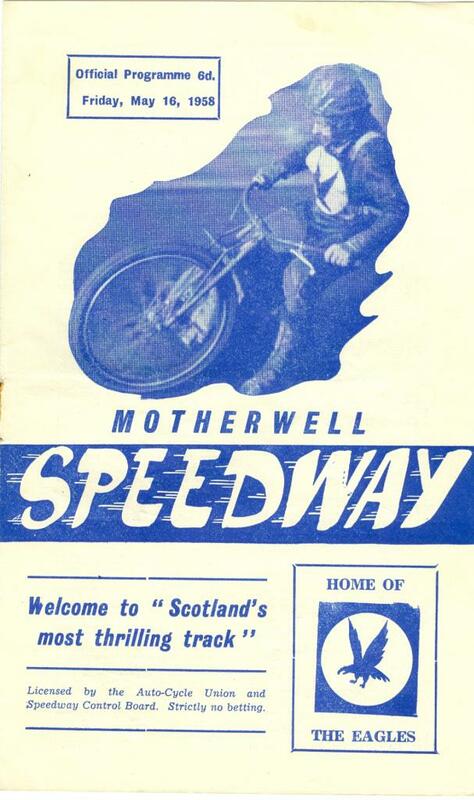 The meetings showed that there was still an interest in speedway north of the border, but the travelling was quite demanding, and at least one team resorted to travelling up by main line train and alighting at Motherwell station, a short push to the track. The railways featured quite prominently in the Motherwell operation. As they had done a few years earlier, a special train was run, leaving Glasgow Central at 6.40pm and returning from Motherwell at 9.50pm. Previously, the fare had been one shilling and thrupence, but it was now two shillings and tuppence, suggesting perhaps that the rail authorities didn’t think there would be nearly as many passengers as in previous seasons. Hoskins kept his word about providing a variety of entertainment. He had midget car racing, featuring Mike Parker, later a founding father of the Provincial League, and even later the man who brought speedway to Edinburgh’s Powderhall. Other attractions included a display of model aeroplane aerobatics by the Glasgow Gremlin Club, and a Hoskins “staple”, a Penalty kick competition. The Eagles were generally too strong for the opposition, and the problem of finding visitors willing to make the long journey north on a Friday was all too evident, with Jack Kitchen, Brian Meredith and Colin Goody, all being booked to appear in at least two meetings. By staging meetings every fortnight, problems of the same faces appearing were reduced and the crowd didn’t get the “same old, same old” feeling that other open licence attempts were prone to. In all five meetings were staged but after that the Eagles had more or less run out of opponents, with the remaining league tracks being Swindon, Wimbledon, Norwich, Southampton, Oxford and Rayleigh, none of which were too handily placed for a trip to Lanarkshire. The Southern Area League comprised Rayleigh, Aldershot, Eastbourne and Rye House and while it would have been interesting to see a match up between a SAL outfit and the Eagles, this was never a viable proposition. While it was a promising short season, it wasn’t repeated the following year. Had the Eagles opened up again in 1959 for a similar short season, then this venture would probably have been considered a success, and, indeed, it may well have led to Motherwell, not Edinburgh, becoming Scotland’s first entrants into the fledgling Provincial League in its inaugural season in 1960. However, it didn’t happen. Once again persuading riders to travel north, and the costs involved, was to prove to be an insurmountable obstacle. Down south, the Southern Area League was being formed, attracting the sort of junior riders that had turned out in Motherwell’s challenge meetings. If Motherwell had only been about 400 miles further south then it could have joined this junior league enterprise. Somewhat paradoxically it may well have been a meeting held at Old Meadowbank in Edinburgh in April 1959, that scuppered any hopes of a future Motherwell revival. Ian “Bruno” Hart, a student at Edinburgh University, and later to be a second halfer at Old Meadowbank, arranged an individual meeting in aid of the Edinburgh Students Charity fund, featuring most of the riders who had turned out at Motherwell. This event was well attended, particularly as Hart had pulled off a major coup by persuading Ronnie Moore to ride in second half races. Can you imagine something like that happening today? One of our juniors getting, say, Jason Crump to come and ride in a charity event in Scotland! This historic meeting probably led to Hoskins deciding that Edinburgh would be his preferred location for a PL team in 1960, a team that was comprised almost entirely of the riders who rode for the Eagles in 1958. Interestingly, Hoskins would later describe his deal with the Edinburgh Council to use Old Meadowbank as being foe a "peppercorn rent". No doubt this was a major consideration too! It may well have been that close for Motherwell, but it was not to be, and the stadium was later demolished, although the site wasn’t redeveloped.